Well, I locked picture and sound today, a full 22 hours before the deadline for submitting to my school’s short film festival (not that anyone reading this is in Colorado Springs, but just in case, here). So glad to be done with it, at long last. There is still more to do, as I’m going to submit to film festivals (I allocated funds from my budget for this) but I don’t plan to start that process until next week. Tomorrow I have a photography critique, then music composition jury, then I officially submit the film, then there is judging that night for the festival, which I will attend. After that I’m going on a much-deserved 2-day vacation. May 1st, Overwhelming Majority will be unleashed on the world. These 14 were narrowed down from a collection of ~32 images that I considered using, and the one good thing the photo book will give me is to be able to include some images that perhaps I should have, but couldn’t see their value at the time, or being forced to choose images for the sake of size/length. On a technical note, I’ve been noticing scan lines on some of these. I honestly don’t know if it’s the scanner or not, because I’ve been rescanning a few color rolls, and nothing shows up there. One thing I haven’t tried yet is using another scanner for black & white, or optically printing any (sacrilege of sacrileges, I’ve been digitally printing black & white film images). Sooner or later I’ll find out what’s going on, but I don’t know which would be worse, disassembling my Pakon scanner and trying to clean the sensor, or finding out that there are strange flaws in my negatives. Probably something that hasn’t been thought about at least in terms of the lens sales is that some people are abandoning new autofocus plastic lenses in favor of used manual focus lenses with real glass in them. Another thing I was thinking was that, just looking at that graph of camera sales, is that we really can see planned obselescence (and digital rot!) at work here, and the implication of so much waste. Has it really been worth it? Digital camera makers have had a feeding frenzy for the past 10 years or so, but the fat years are over. But really, what the graph shows is that camera sales are achieving equilibrium after a spike in sales. Or will they? Can selling 5 million cameras keep the digital camera makers afloat after they’ve become accustomed to such large sales volume? I wonder what the profit margins are like now compared to say, the 1970s and ’80s. Do they make more money now, or less per camera? Actually, streaming music on Spotify is very bad. Tech companies and online platforms are trying to take the place of record labels without having to do any of the work associated with a traditional label, like advances, tour support, distribution, promotion, plus the royalties paid out are so atrocious that musicians can’t make any money off it. And the average know-nothing consumer thinks that musicians are being treated better since the digital revolution. Nope, sorry. And if musicians that have supported themselves in the past using their art can’t make a living making music anymore, they aren’t likely to continue doing it; the same can be said of the photography world as well. I know several people who are or used to be professional photographers. One of them said this about it: “I’ve been replaced by a selfie stick.” I’m quite aware of the writings of David Brin and his assertion that we are moving away from the culture of the professional toward that of the talented amateur. I see it all around me, with an ongoing homogenization that plays up to the lowest common denominator. As much as scarcity creates value, In the future everything will be bland, but there will be more than enough for everyone. In the future, everyone will be famous for 15 minutes, but I doubt anyone will be remembered. So besides the writer being mildly aware that this change will be massive and disruptive, as much as it already has been, what new insight is given? The “purists” will be those using desktop computers and old software to make the shots from digital cameras look more like film (and what does that make me)? The doom and gloom is in between the lines, but I’m pretty sure the downfall of civilization is held in the idea that digital photographers would consider themselves purists. So you might as well buy the latest smart phone, pay your monthly subscriptions to gatekeeper companies for continued access to things that used to be owned, and stay in the middle of the flock where it’s safest. Just don’t bother my Pentax Spotmatic and me. A friend of mine from church turned 37, so the guys all decided to celebrate…by hanging out in a garage. I guess this will probably show my young age, maturity level, what have you, but still, it sounds like kind of a lame birthday. I suppose when you and everyone else you know is 30-something and married with a family, grabbing a few hours in a garage for a few beers and a pipe is kind of all that can be expected. I don’t know, it’s not really a part of “growing up” that I can say I’m looking forward to all that much. That said, it was still more socialization than I usually get, and I haven’t gotten to hang out with these guys nearly at all since I moved down to the big city. Also, I haven’t celebrated my own birthday for years now, really. It always falls on finals week so my friends never wanted to do anything, and after a while I just stopped feeling like my birthday was anything worth celebrating. Besides, after you turn 21, there really isn’t much point to aging is there? This is the last roll of film I shot through my (first) Canon 7 before it broke down. My replacement came just yesterday, and hopefully that camera will be problem free. 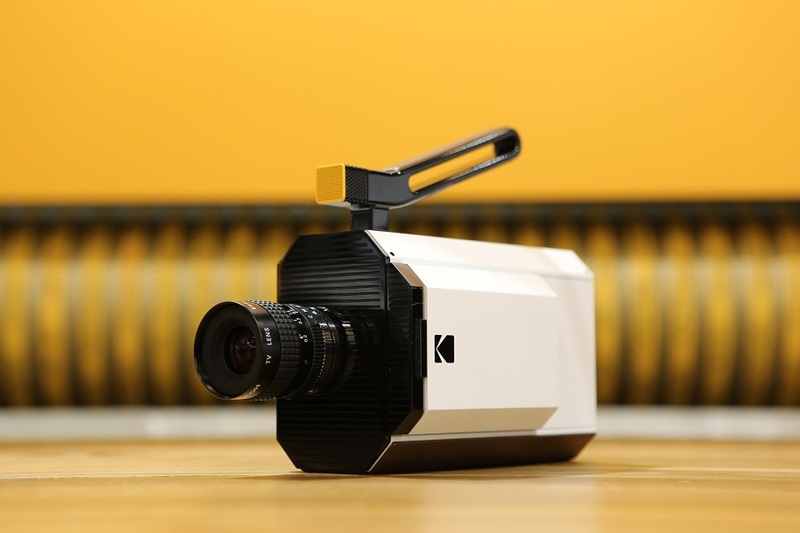 It seems that finally Kodak is working on opening an online store. It’s not ready yet, but you can look around at their film offerings, and it’s nice to be able to see the price that Kodak charges for some of those films compared to places like B&H. I signed up, though I’ll have to scrape to afford even the optimistically low-end estimate of $400. If rumors around the grapevine are true however, things could be much better than they are with the new camera. Evidently Kodak is pouring tons of money into the aesthetic design and little into usable features. I hope we get the features already advertised–if they reneged on those I’d be very mad–but some of the things I’ve been hearing that are possible on the new camera, are being overlooked in favor of the way it looks, ignoring the opinions of real-world filmmakers and other knowledgeable consultants. Features like a sound blimp, water-tight housing, remote wi-fi monitoring, things that the GoPro has that could be included and make this appeal to more serious filmmakers. Remember what I said in this post? So when are they going to listen to the people who have great ideas for innovative features? And if they don’t get this camera right, how in danger are they of shooting themselves in the foot? I used one of these pictures superimposed over my face for my 2nd critique. UCCS has its own anechoic chamber on campus, an interesting feature and one that my sound art class was very interested in seeing. I’m not really sure how common they are, but not very from what I understand. People are in the middle of running experiments in ours, so we weren’t allowed in very long and only a few at a time. They wouldn’t even shut the door all the way, so I could still hear people talking outside, but in front of me, there was nothing at all, and I felt a pressure build up in my ears from it. In some ways, I’m glad that I had the sounds coming from behind me as something to hold on to, but on the other, I didn’t feel like I got the full experience. It was quite dark inside and my shutter speeds were quite low, around 1/8, even 1/4; I steadied the camera against the foam as gently as I could, because evidently the foam is extremely sensitive and can crumble easily (see the missing points in the last two pictures). The chamber itself was built in the late-’70s/early-’80s, and there’s no more money to improve or repair it.